In the project, you will find the folder public. This is the folder that contains the default template. Rename it to public_md. We will not use this folder anymore. There is another folder public_example. Make new copy of that folder and rename it to public. This will be our new public folder. In the folder you copied, there are one .css and one .js file we use cross template. You can modify the values and functions of them to suit your need. This is how the folder structure should look now. Download your HTML Admin Bootstrap template. If zipped, extract it. Most of the HTML admin templates contain asssets folder that contains all the image + js + css. Copy the asssets folder ( or similar ) and put in in the public folder. 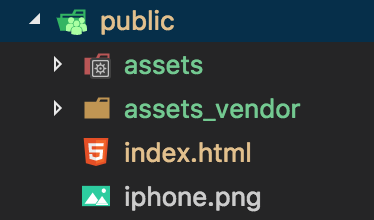 This is how the folder structure of the public folder should look now. Open the index.html you just copied from your template. Change the title atribute to match your needs.